AVG Anti-Virus Free Edition– Protect your computer from viruses and malicious programs. Avast Home Edition– Scan your computer for viruses, worms, and Trojan horses. PC Tools Anti-Virus Free Edition– Protect your PC from viruses, worms, and Trojans. Avira Anti-Virus Personal Edition– Detect and remove more than viruses from your computer. A-Squared– Protect your PC from harmful threats. Realplayer– Download and watch Web videos with a media player and jukebox from RealNetworks. VLC Media Player – Play audio and video files with this cross-platform media player and streaming server. 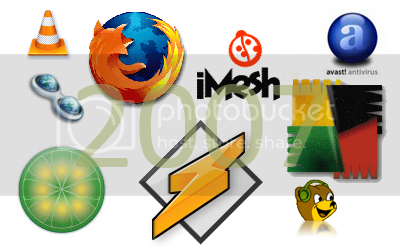 Winamp– Play and organize a variety of audio and video files, as well as rip and burn CDs. Windows Media Player– Play local and streaming multimedia content. QuickTime– Play MPEG-4 movies with AAC sound with latest version of Apple’s premier media player. Sonique– Enjoy your MP3, CD, WAV, MOD, and WMA tracks with superior audio quality and impressive visual effects. JetAudio Basic– Play audio and video files, convert to other file formats, and burn CDs. FLV Player– Play Flash video files on your PC. GOM Media Player– Play back video files in most of the popular video formats. Bitcomet– Share and download files from BitTorrent and chat with your friends. BearShare– Search for and share all kinds of files over the Gnutella network. Limewire– Search for and download files located in P2P networks and share your files. Torrent Swapper– Host file sharing and distribute large files. Morpheus– Search multiple P2P networks including BitTorrent to download MP3s, videos, and games. BearFlix– Search and download videos. FrostWire– Download and share files on Gnutella network. iMesh– Find, download, and share MP3, video, and image files. eMule– Search and share files over the eDonkey2000 and Kad P2P networks. Avant Browser – Block pop-up windows and browse multiple sites at once. Opera – Browse with a multiple-document interface, mouse gestures, keyboard shortcuts, zooming functions, and integrated search. Mozilla Firefox – Surf the Web, block pop-ups, and keep spyware at bay with this lean and fast open-source browser. Internet Explorer – Browse the Web with tabs, improved RSS support, and robust security features. Netscape Communicator – Browse the Web and more with Netscape’s browser suite. Slim Browser– Browse multiple Web sites in one window with a pop-up killer, an ad blocker, and a quick-search feature. AOL Active Security Monitor – Evaluate your computer to ensure that your PC and home network are safe from most security threats. Belarc Advisor – Plug a PC audit into your browser with details on hardware and software. TweakNow RegCleaner Standard – Remove obsolete entries from your Windows Registry. Auslogics Disc Defrag – Defragment your disks and improve computer performance and stability. SpeedFan – Monitor fan speeds, temperatures, and voltages in computers with hardware monitoring chips. Advanced WindowsCare Personal– Protect, repair, optimize, and clean your computer in one click. ICQ– Communicate instantly using the latest version of this popular chat client. Windows Live Messenger– Connect and share instantly on the worlds most popular IM network. Trillian– Chat with all your friends on mIRC, AIM, ICQ, MSN, and Yahoo Messenger. Burn4Free CD and DVD: Burn CD/DVD data and audio from different file types. Windows Essentials Media Codec Pack:Play back almost every video or audio file formats on your computer. Videora iPod Converter: Convert all types of video to play on your iPod.